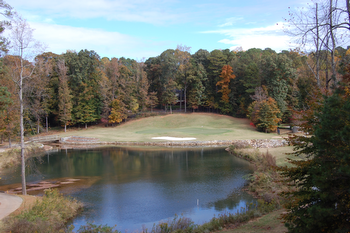 Our golf course winds its way through a beautiful and completely natural setting that will both please the eyes and challenge your golf game. Each day, we have five sets of tees available to accommodate golfers of all ages and abilities, but be forewarned before you tackle our Black Tees. 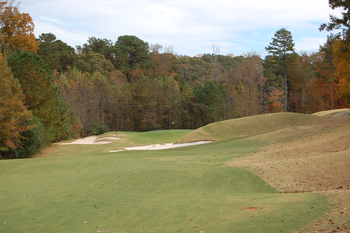 While the course is slightly less than 6,800 yards from the tips, Smoke Rise was recently featured in a Golf Georgia/GSGA article as the second most challenging course “Pound for Pound” from our back tees. 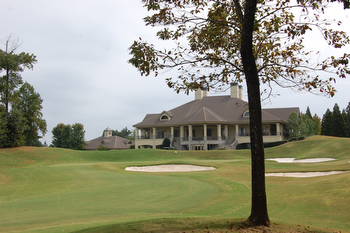 We are also home to the perennial NCAA Division III golf powerhouse team from Emory University whose players hone their games and skills at our club. 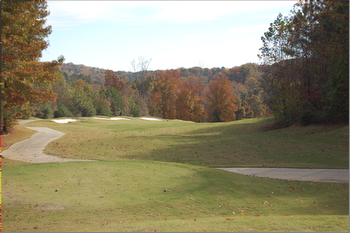 Please take the following hole by hole tour for a preview of the golf experience that awaits you at Smoke Rise Country Club. Click here to view a specific hole. No. 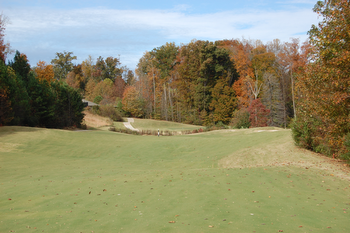 1 is a short par 4 that calls for accuracy both off the tee and on your approach shot. Big hitters should leave the driver in the bag. The ideal line from the tee is to the right of the last fairway bunker. There is more room to the right than is visible from the tee and anything over the fairway bunkers to the left will find the lateral hazard. 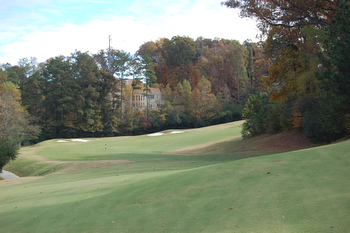 Your downhill approach shot will play at least one club shorter than the yardage. The deep green is heavily sloped from back to front – so try to keep the ball below the hole! No. 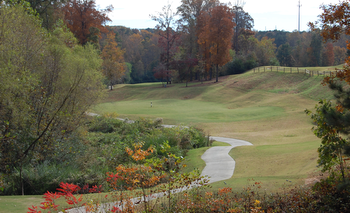 2 is a true three shot par-5 that doglegs to the left. The ideal drive will favor the left side of the fairway and go past the large tree on the left side, leaving a clear view of the fairway for your second shot. All but the longest hitters will need to play their second shots short of the ravine that cuts across the fairway about 80 yards in front of the green. 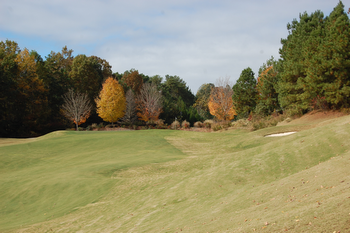 Once again, favor the left side as the fairway slopes to the right and the bunkers to the right are to be avoided. For your approach, pay attention to the pin location as there is a two club difference between a pin on the front shelf and one tucked in the back. Missing the green a little bit short and left is much better than to the right or long. No. 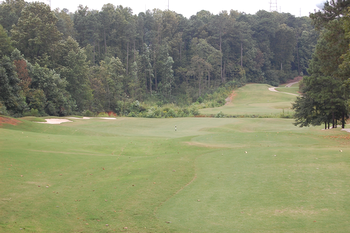 3 is a pretty down-hill par 3 that plays at least one club shorter than the yardage. The green is again quite deep so check the pin position and adjust accordingly. It is easy to run out of room to the left, to the right and long, but leaving the ball a big short of the green will not get you into any trouble. No. 4 is one of the trickiest driving holes on the course. 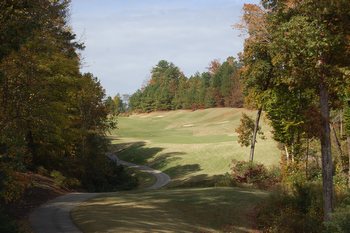 A tight dogleg left, the optimal play from the tee is a slight draw over the 150 yard marker navigating between the lateral hazard to the left and the hillside and rough on the right. Big hitters should leave the driver in the bag. A well placed tee shot leaves a short or mid-iron that plays slightly downhill over a stream to a green that is angled away from the fairway. If the pin is on the back right of the green, take an extra club and avoid the grass and sand bunker complex that will swallow any shots hit short right. No. 5 is the mirror image of the last hole and calls for a fade from the tee over the 150 marker. It is easy to run out of fairway to the left and driver may not be the best play for long hitters. 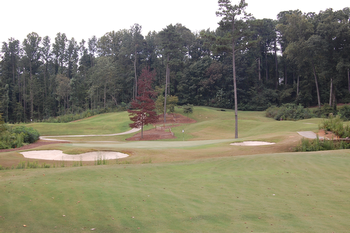 The approach shot is again played over a stream to a well-bunkered green. The green slopes from back to front and from right to left so keep the ball below the hole if possible. No. 6 is a long and dramatic par 5. Aim your tee shot well right of the fairway bunkers as the fairway and hillside slope hard to the left and shots that go over the fairway bunkers will not be found. 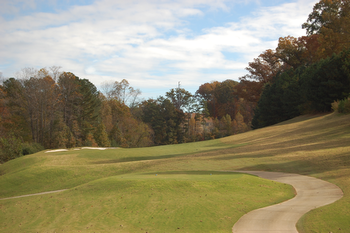 The fairway tightens up immediately after the bunkers and then opens up again at the 150 yard mark. A well placed second shot must get past the corner of trees on the right hand side of the fairway while staying short of the second set of fairway bunkers through the fairway. With that accomplished you will have a short iron straight uphill to the green. The green is protected by a false front and a grass bunker so take at least one more club than the yardage and make sure you fly the ball all the way to the green. No. 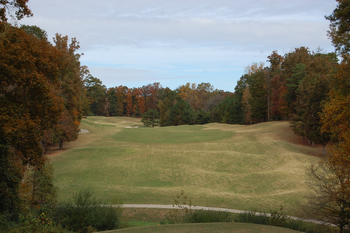 7 is a beautiful and difficult par 3 that plays to an extremely large and undulating green. Large bunkers and a lateral hazard protect the right side so err to the left as shots down the left side will sometimes bounce their way onto the green. But don’t overdo it: a fence and OB stakes lurk beyond the cart path and trees. On the green, keep in mind that most putts will break toward the bunkers on the right. No. 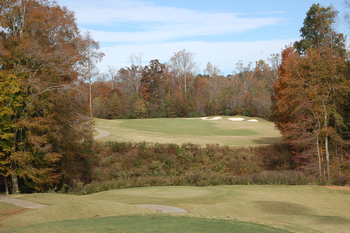 8 is a sporty short par 4 that invites long hitters to try to carry a ravine cutting across the fairway 90 yards short of the green, leaving a short shot and a chance for birdie. 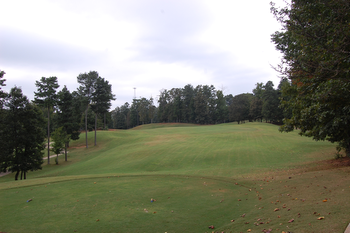 The smarter play, however, is to lay up past the 150 yard marker, which leaves a delicate iron into a two-tiered green. If the pin is on the back-right shelf, take an extra club. Otherwise try to keep the ball to the left of the bunkers and below the hole. Avoid missing the green to the right side at all costs! No. 9 is a long par 4 that plays straight up hill. Aim your drive slightly to the left of the fairway bunkers and swing away! 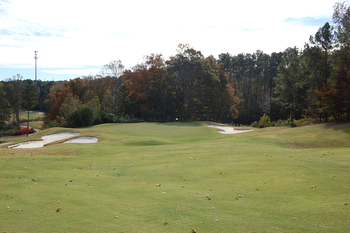 The massive green has a false front and is blind from the fairway, making club selection very difficult. Depending on the pin position, take at least two extra clubs and favor the right side as deep bunkers will swallow any shot missed to the left side. Par is an excellent score here! No. 10 is a short dogleg right par 5. 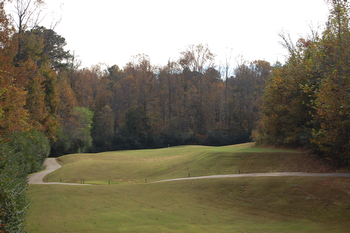 The drive plays downhill to a landing area about 250 yards from the green. Aggressive players can try to cut the corner to the right setting up a shorter shot into the green but beware: it is easy to run out of fairway even if you manage to clear the corner. After a strong drive, you may be tempted to go for the green in two but the safer course is hit your second shot to about 100 yards short of the green, favoring the right side where there is more room and the ball should bounce back to the middle of the fairway. 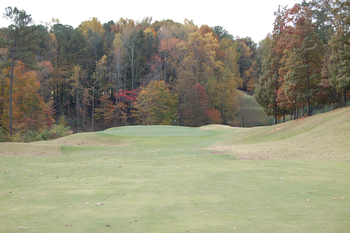 The deep green slopes left to right. Keep your misses short and to the right as left of the green is trouble and long is even worse. No. 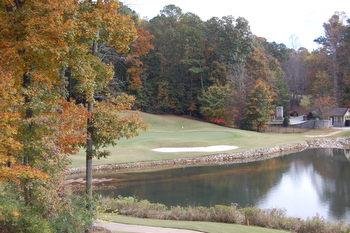 11 is our signature hole, a beautiful downhill par 3 that plays over a lake to a crescent-shaped green wrapped around a devilish bunker. 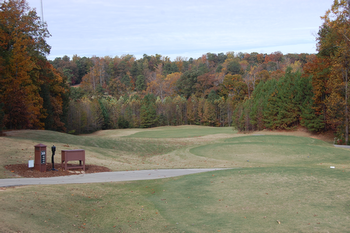 Multiple tee areas combine with the location of the pin so that this hole plays differently every round. 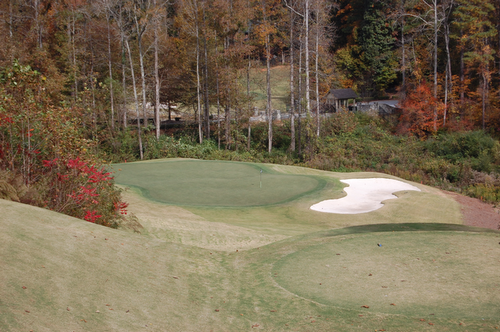 Check your yardage carefully and try your best to be on the same side of the green as the pin. A chip from the same side as the flag is much better than a putt from across the green. No. 12 is a challenging dogleg left par 4. A strong drive favoring the left side will find a flat area near the 150 yard marker. Long hitters, however, may want to hit less than driver as it is easy to run through the fairway, leaving an awkward uphill lie in difficult rough and a blind shot into the green. The second shot plays downhill so take one less club. 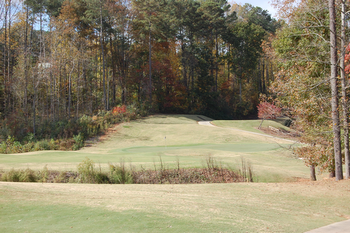 It is much better to miss the green short and right as your ball might catch the slope and bounce onto the green. Shots to the left of the green or long will find nothing but trouble. No. 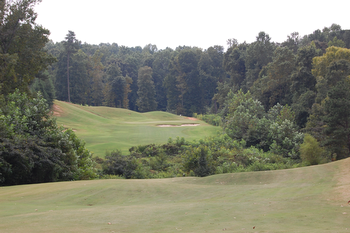 13 is a mammoth par 5 that will test your skill, your stamina and your nerves. Let loose with the driver to a wide fairway that lies well below the tee boxes but be mindful of the hazard stakes running along the left side. Bombs away on the second shot aiming at the 150 yard marker. 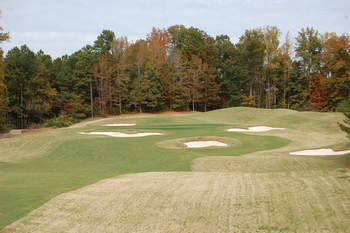 Take an extra club on your approach shot, which must carry both a bunker and the false front of the green. Any shots hit short of the green will roll back into fairway or the bunker, while shots over the green will leave a ticklish shot back down the heavily sloped green. Accuracy is required! No. 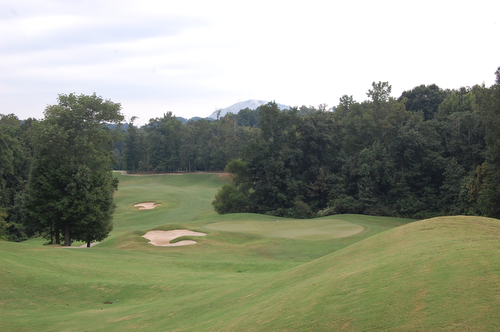 14 is a downhill par 3 offering great views of Stone Mountain. Take a club (or two) less than the yardage. The safe play is to the middle of the green. Short right is ok but left or long will lead to big numbers. No. 15 is a dogleg left par 4. 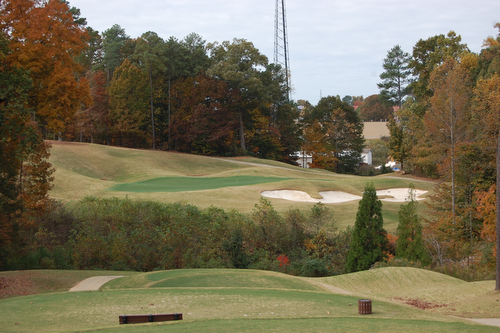 Aim your drive at the 150 yard marker, making sure to carry the bunkers in the middle of the fairway. Long hitters can take a more aggressive line to the left but be careful not to over-cook it or you will find the hazard line jutting out on the left hand side. Likewise, a drive hit to the right or through the fairway will leave a long uphill shot from the rough into a blind green. The green itself is deceptive and tilted from front to back and from right to left. There is some room to bail out to the right but shots that miss the green to the left or long will find the sand or a grass bunker (or worse). No. 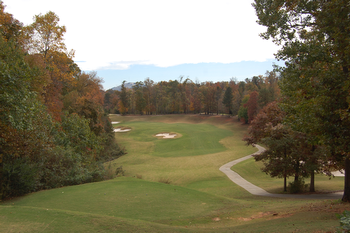 16 is a strategic par 5 that could leave you elated or deflated depending on how well you navigate its challenges. 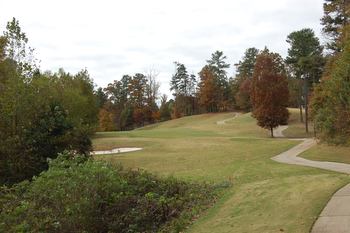 Thick vegetation runs all along the left hand side, so the smart play is to favor the right side off the tee. Long knockers might want to test the left side with a draw which, if hit perfectly, can lead to a great opportunity to reach the green in two. 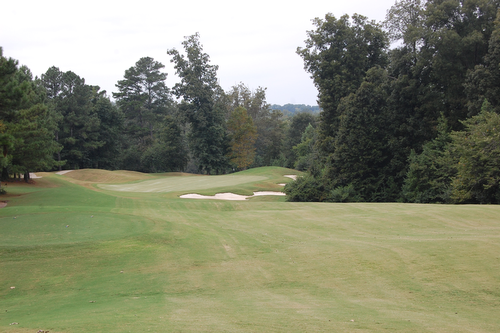 Most players, however, face a daunting choice for their second shot: whether to lay-up to the 150 yard marker at the bottom of the hill; or to try to carry the deep ravine leaving a wedge into the green. Either way, favor the opening on the left side with your approach shot to avoid the large bunker and hazard guarding the green short and to the right. No. 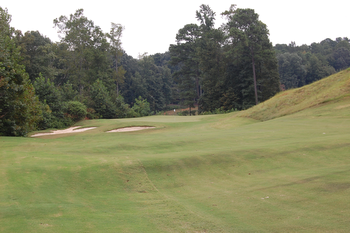 17 is a great par 3 and the pin position will dictate both your strategy and club selection. If the pin is tucked back right behind the massive bunkers, you will need to take an extra club in order to attack the flag. The safer course is to aim for the middle of the heavily contoured green. Keep in mind that it is easier to recover from the left side than from the bunkers that lurk short or from the hazard to the right. No. 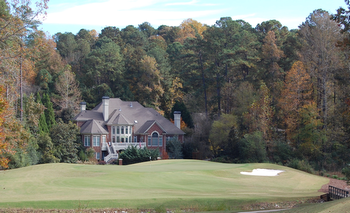 18 brings us home playing into a gorgeous view of our clubhouse. Aim your drive at the 150 yard marker, avoiding the bunker to the right which can only be carried by long hitters. 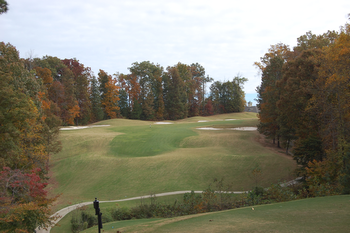 From the fairway, the hole turns slightly to the right and plays uphill to a well bunkered green. The green is very large but mostly blind from the fairway. You can run the ball up through the opening on the left side but make sure to take an extra club if you are going to fly the bunker guarding the right side or reach a back pin position.